Summers! 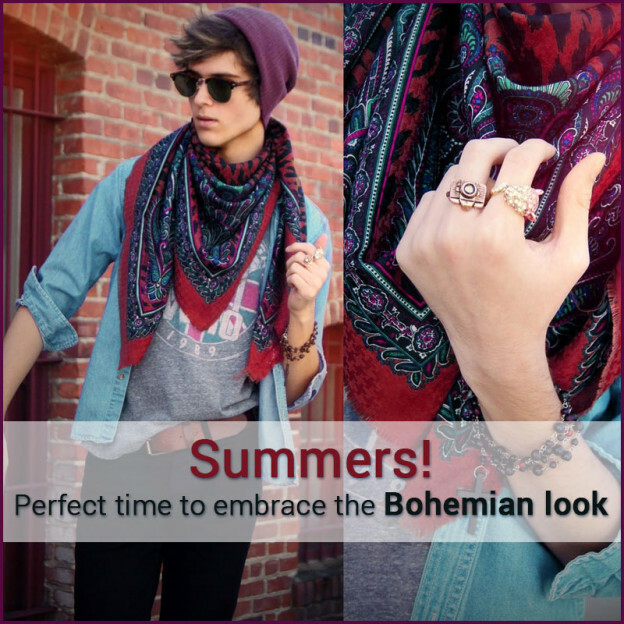 Perfect time to embrace the Bohemian look! Denims: pick denims which are lighter in shade – blue shades like sky blue color or white will be your perfect pick. The distressed or faded jeans are a must have for the bohemian look. The next thing you can do is rip your jeans at home – this will make you look relaxed while giving you a “nonchalant” attitude. Add some art to your style: art here means adding something catchy to your attire like scarves or stoles with abstract designs, sayings, inscriptions, iconography, tribal patterns, graffiti's or hand printed images. All these give a bohemian style. Floral Prints: Ditch your boring work and prints on your T-shirt/shirt and add flower print to your outfit. Team your floral shirt with your khaki, denims or chinos. Keep it relaxed and mellow. They are a perfect way to dress down. Jacket: Pick a suitable jacket in shades of brown or tan, although Suede is the best option than leather. Fitting is an important aspect when choosing a jacket. Mix it with any outfit, it goes well with everything. Sandals: colorful and funky footwear are best for your bohemian look. Team them with your cargos, chinos, khakis or denims. These are extremely elegant and stylish, especially in the warmer months. Accessories: there are many jewelry to choose from like leather bracelets, handmade jewelry, beaded bracelets, beaded neck-pieces, tribal jewelry, rings, colorful and chunky pieces, stud earrings, funky belts, messenger bags or bag pack. Pick your favorite in soothing or vibrant hues. On a Final Note: The Bohemian look is all about freedom and creativity. So, dress like you wish for. Don't end up stressing for your look, keep it real and stylish.